It’s always kind of weird writing about oneself. So… to clue you in on this Chica, we’re going magazine style interview. Why I Run…Does “it is in my blood” count? I think I was born running, or in motion, always wanting to do something active. As a 4 year old, I was obsessed with the Bionic Woman. I wanted to run like her. While most kids built forts out of chairs and sofas, I spent afternoons jumping from couch to couch, imagining a life with bionics and wonder. As I got older, I found other ways to be active- cross country skis were a Christmas gift in 1st grade, a ten speed came in 3rd. Anything that got me in motion was my cup of tea. Later, I became a bit of a fitness freak, and added running upon the suggestion of my older brother. Start in marathoning… Being eternally in motion, one would think I always have always run marathons. However, this didn’t come until 2003, when I ran my first marathon with an awesome bunch of people in a Team in Training Marathon. This was the start of many incredible friendships (plus meeting my husband!) and the start of running as a mainstay in my life. 23 marathons (and counting!) later, I love the sport (and my friends!) even more. Favorite spots to run… Since I live by the shores of beautiful Lake Michigan, I feel fortunate to have what I call “the world’s best running route” just a few blocks from my house. 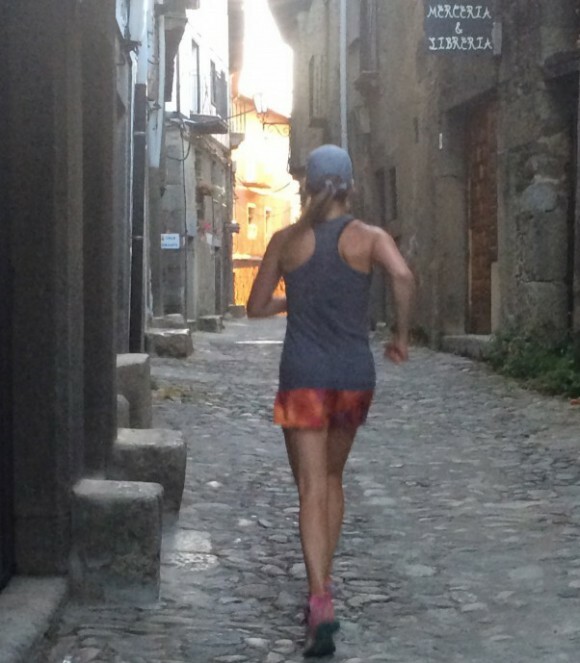 I also dig cool urban routes around the world, and running through my favorite spots in Spain – Retiro Park, La Alberca, or the streets of Cordoba. My dream is to run the Madrid Marathon. On 5 a.m. runs… I. Love. Them. To me, there is nothing better than getting up early, meeting my friend, and getting 5 miles in while the city sleeps. Even 5 a.m. treadmill runs are okay. Winter running… It’s March as I write this, so I must admit I’m at my breaking point with the winter. However, I find running in cold weather to be not that bad. If I have to be outside in the cold, I prefer to be running. I love the feel of crisp air and the satisfaction I feel when I walk in my toasty house at the end of a run. Shaking it up… 5 years ago, I discovered Bikram Yoga. I think it’s the perfect compliment to a regular running practice. Since becoming a yogini, my knees no longer hurt when I go down stairs, plus I feel just better conditioned and balanced overall. Eating Plants… After a lot of experimenting with different ways of eating, I’ve found that I just feel better following a plant based diet. A bunch of resources (Forks Over Knives, Yum Universe, No Meat Athelete, One Part Plant, and Thrive) have schooled me nicely in plant eating, and given me solid medical evidence to support my hunch that it makes sense to choose plants and whole foods over meat, dairy and processed foods. This is what works for me; everyone needs to pick their own plan. Other writing gigs… I’m hoping to do a lot of writing in 2015, and discover new places on the web where I can say a few words. One of those places is the LPGA’s Girls Golf site, where I’ve been able to combine my love of golf with my love of writing in a series of articles. Watch for those this year, and hopefully many others around the web. On my book and future books… A few years ago, I wrote a book about the search for love. It’s basically every woman’s story and is enhanced by photos taken by my husband. You can find The Great Search on amazon.com. Also, watch for my first running book, “Why Not 26.2?” this summer! Do you have questions or comments for Runnerchica? Ideas for the blog? Hi – great story. In 1996, at age 57, I ran the equivalent of a marathon or more each day for 75 consecutive days (see http://www.myrunmovie.com. (Twin Cities, MN to the opening ceremonies of the Summer Olympics in Atlanta. My book, A Father’s Odyssey, highlights my life and the theme “Nothing is Impossible”. Proceeds from my book go to charity – diabetes, breast cancer and aspergers. A signed copy can be purchased on my website. An award winning documentary, MY RUN, with Billy Bob Thornton will be out this summer in theater and DVD.